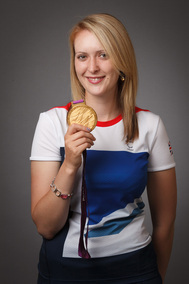 Double Paralympic gold medallist, three times World Champion and multiple world record holder Danielle Brown is offering sport psychology sessions to help others succeed in sport. When striving to discover exactly what separates the best in the world from everybody else, Danielle was always drawn back to the psychological elements of sport. She has now turned to coaching and aims to make sport psychology accessible at grassroots level and beyond, helping athlete’s progress to the next level. The workshop Performing Under Pressure has the sole purpose of enhancing performance in competitive sport. It is designed for athletes by an athlete, supplying them with the strategies and information they need to succeed. If your performance in practice is better than in competition. Increasing your confidence and self-belief. Teaching you how to thrive under pressure. Increasing your consistency in performance. Peaking – gearing your schedule up for performance. Each participant will be given an instructive workbook to act as an ongoing guide, helping them both within and beyond the workshop. Coaches will also find the session valuable, helping their athletes to build these established strategies into their training programme which will ultimately enhance their performance. Cheques made payable to LCAS and sent to B Molsom Mon-Vere Station Road, Hubberts Bridge, Boston, Lincs, PE20 3QT..